Arthur Morrison (1863-1945) is generally considered to be the best of the Victorian writers of detective fiction with the single exception of Sir Arthur Conan Doyle. Morrison wrote a total of eighteen short stories recounting the cases of private detective Martin Hewitt. Dover’s paperback collection The Best Martin Hewitt Detective Stories includes nine of these marvelous stories. The first Martin Hewitt story appeared in the Strand Magazine in March 1894. Morrison was already beginning to make a reputation for himself as a mainstream writer specialising in fiction dealing with slum life (Morrison’s own early life had been spent in considerable poverty). Detective fiction was not something he took all that seriously - in the wake of the enormous success of Conan Doyle’s Sherlock Holmes stories (which had started appearing in the Strand Magazine in 1891) detective stories paid very well and he needed the money. Whether he took detective fiction seriously or not he proved to be remarkably good at it. The Lenton Croft Robberies requires Martin Hewitt to solve three robberies at the home of a slightly crusty baronet. The robberies seem to have been the work of a single thief but there are some puzzling differences. On two occasions very valuable jewels were stolen but on the third occasion only a cheap brooch was stolen. All the robberies seemed to have been, if not impossible crimes, certainly exceptionally difficult. The Stanway Cameo Mystery is a case in which Martin Hewitt was widely believed to have been failed but as the narrator points out this was certainly not the case. The Roman sardonyx cameo in question is so unique that it would be remarkably difficulty for the thief to sell it. In The Nicobar Bullion Case a steamer carrying a shipment of gold bullion sinks. The steamer is salvaged but two cases of gold are missing. These stories date from the time when murder had not yet become the crucial subject matter of the tale of detection. Martin Hewitt’s cases are usually just the sort of cases a working private detective would be expected to encounter, but with one crucial difference. They often turn out to be not all as they appeared to be on the surface. The Holford Will Case seems to be a very simple case of a missing will but then it veers into the realms of the weird. It’s far-fetched but it deals with a subject that was quite an obsession to the Victorians. The Case of Mr Geldard's Elopement appears to be exactly the kind of routine matrimonial case that Hewitt generally avoids but it turns out to involve a rather surprising crime. The Case of the Ward Lane Tabernacle is another example of Morrison’s skill in misdirection. The Case of the Missing Hand seems like it really is a murder case but there’s a good deal more to it than that. The Case of the "Flitterbat Lancers" begins with a rock thrown through a window. A piece of paper is wrapped around the rock, containing a piece of music. But the "Flitterbat Lancers" is a tune that nobody can play. Which is the cause of some vexation to certain parties since £20,000 is at stake. At one point Martin Hewitt tells a client that his method consists of little more than careful observation and common sense. Which is more or less true. It just happens that Hewitt has developed those faculties to a remarkable degree. He certainly places little reliance on leaps of intuition or psychology. He simply follows the clues with an open mind and he follows them wherever they may lead him, even when the conclusion to which they point seems very unlikely. So skillful is Morrison’s plotting that this provides a more than adequate basis for these stories. The solutions are unexpected but they are wholly satisfying and we have to admit that Hewitt’s chains of reasoning are entirely sound. Morrison made his detective the complete opposite of Sherlock Holmes in style and personality - Hewitt is amiable, self-effacing, even-tempered and entirely lacking in eccentricities. Apart from this Morrison followed Conan Doyle’s successful formula very closely. 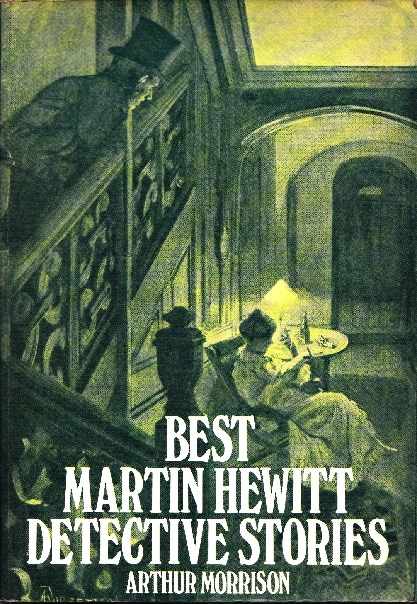 The Martin Hewitt stories were written to make money and they were written precisely to appeal to readers who had loved the Sherlock Holmes stories. It is the brilliance of Morrison’s plotting, allied with his lively prose, that makes him more than just a Conan Doyle imitator. The Martin Hewitt stories are good enough to stand on their own merits. 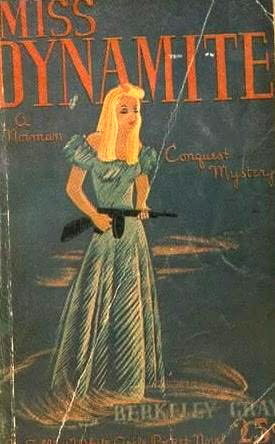 The Martin Hewitt stories were highly successful and their author also enjoyed growing success as a writer of mainstream fiction. He then, for reasons that have never been explained, simply stopped writing. Before he stopped he did however pen a wonderful series of short stories, collected as The Dorrington Deed Box, about an immensely entertaining rogue who dabbles in the private detective business for his own enrichment. 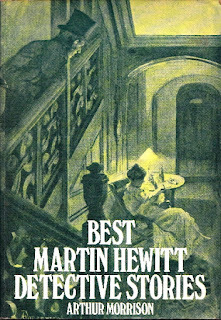 The Martin Hewitt stories are finely crafted little gems of detective fiction. Highly recommended. 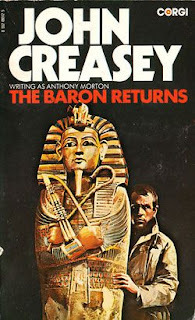 The Baron Returns was the second of forty-seven novels in the Baron series written by the unbelievably prolific John Creasey (1908-1973) under the pseudonym Anthony Morton. The Baron Returns was published in Britain 1937 (and appeared in the US under the title The Return of Blue Mask). The Baron belongs to the tradition of fictional gentleman thieves, a genre that originated in late Victorian times with E. W. Hornung’s justly celebrated tales of Raffles, The Amateur Cracksman. In fact Creasey won a literary competition to find a worthy successor to Raffles with his first Baron book, Meet the Baron, in 1937. By the 1920s the gentleman thief genre had changed slightly. Actually the change can be dated slightly earlier, to the appearance of Louis Joseph Vance’s The Lone Wolf in 1917. Raffles was quite unapologetically a thief. He did have some vague notion of ethics. He only stole from people who could afford the loss. He was however a man who lived a life of ease and luxury on the proceeds of crime. The new breed of gentleman thief had to be more in the Robin Hood mould. He was allowed to make a very comfortable living from thieving but he had to do good as well. He had to punish wrongdoers, and at least some of his thieving had to be for the benefit of innocent victims of other crimes. Bruce Graeme’s Blackshirt (published in 1925) was the first English example of this new type of ethical thief. The Baron started his literary career in Meet the Baron as a relatively straightforward Raffles-style glamorous cat-burglar. The Baron Returns sees him moving quite dramatically in the Robin Hood direction. The Baron is actually John Mannering, an elegant man about town whose income is woefully insufficient to support his extravagant lifestyle. Like Raffles he sees crime as his only viable option. He has now made enough money from burglary to be reasonably secure financially. This allows him to concentrate on carrying out burglaries for much purer motives, such as helping unfortunate widows who have been victimised by unscrupulous stockbrokers and shady lawyers. In the course of such a wholly laudable burglary he comes into possession of some extremely interesting documents - documents that could put a crooked stockbroker in gaol for a long stretch, and documents that could threaten the future of a wealthy American financier. John Mannering intends to make full use of this information, but he has to do so in a way that will threaten neither his own comfortable existence nor the well-being of any innocent parties. Not surprisingly one such commendable act of virtuous burglary leads to the necessity for another, and yet another. In the course of these activities the Baron finds himself tempting fate - fate in the person of his nemesis, Superintendent Bill Bristow of Scotland Yard. Bristow has already figured out the Baron’s real identity but his problem is that even though he hopes to put him behind bars he actually likes John Mannering a good deal, and recognises that as criminals go he’s a pretty decent chap. The Baron might be a noble thief but he’s determined not to spend the best years of his life rotting in prison and he’s prepared to adopt fairly drastic means to avoid such a fate. He draws the line at murder but he’s quite happy to use his fists and he does so with considerable enthusiasm and efficiency. While other gentleman thieves rely on their wits the Baron is a bit more of a two-fisted action hero. His burglaries generally offer Creasey the opportunity to display his prowess at writing quite exciting action scenes. Creasey liked his heroes to have a bit of complexity and John Mannering is certainly a morally ambiguous hero. He often steals for a good cause but he loves the excitement and one can’t help suspecting he enjoys the more violent side of his adventures. In this novel he crosses swords with another morally ambiguous character, the aforementioned American financier who is certainly a crook but equally certainly not an evil villain type of crook. That’s not to say the novel lacks for evil villains - it has two such characters and they’re pleasingly dastardly and wicked. Superintendent Bristow is a bit ambiguous as well. On occasion he displays extraordinary zeal in pursuing the Baron but at other times he finds himself half hoping he won’t catch him. The relationship between the Baron and Bristow is somewhat reminiscent of that between the Saint and Chief Inspector Claud Eustace Teal. While the Baron has much in common with the other great thriller heroes of the interwar period like the Saint Creasey’s tone is much more serious. There’s none of the lighthearted banter of a Simon Templar, a Bulldog Drummond or a Norman Conquest. John Mannering takes his activities much more seriously and he’s always keen aware of the grim fate in store for him if he slips up. The tone is slightly darker, although never depressingly bleak or overly pessimistic. The Baron is also interesting in that one can see a certain development in the character in the second book as compared to the first. John Mannering seems to be gradually finding a purpose in life. He’s becoming less self-centred. He’s still a long way from being a knight errant in the Simon Templar mode but one can see that Creasey intends him as a character with potential for further development. The Baron Returns is a fine old-fashioned adventure tale with a hint of moral complexity, and it provides plenty of solid entertainment. Highly recommended. 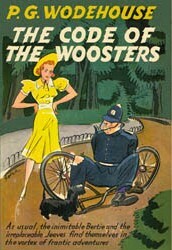 The Code of the Woosters, which appeared in 1938, was the third of P. G. Wodehouse’s Jeeves and Wooster novels. It continues the saga of Gussie Fink-Nottle and Madeline Bassett which began in Right Ho, Jeeves. The prospective marriage between Gussie and Madeline is starting to look like not such a sure thing after all. This is alarming to say the least since it means that, for various comlicated reasons, Bertie Wooster may have to marry her instead. And if there’s one thing Bertie intends to avoid at all costs it is marrying Madeline Bassett. The problem, as ever, is that while Gussie is a wizard with newts he’s pretty much hopeless at dealing with people. The situation is made more dangerous by the fact that Madeline’s father Sir Watkyn, a magistrate, had fined Bertie five quid for stealing a policeman’s helmet on Boat Race night. As a result Sir Watkyn is convinced that Bertie is a hardened criminal who really should be behind bars. To make things worse Bertie’s Aunt Dahlia wants him to go to Totleigh Towers, Sir Watkyn’s country seat, to steal a silver cow creamer. Further difficulties are caused by the romance between Sir Watkyn’s ward Stephanie “Stiffy” Byng and Bertie’s old school chum Harold “Stinker” Pinker, now an impoverished curate. There’s also the presence of Sir Watkyns’ chum Roderick Spode, leader of the Black Shorts and would-be dictator. As you would expect it all gets insanely complicated, Bertie’s efforts to avoid the hideous fate of marriage to Madeline make things worse and Jeeves will have his work cut out for him saving the situation. And even Jeeves, despite his enormous brain, proves to be no match for an enraged Aberdeen terrier. Those who are only familiar with the ITV TV series Jeeves and Wooster may be surprised upon reading the original stories to discover that Bertie Wooster is not actually a congenital idiot. His judgments on people are usually sound and often quite shrewd and he certainly has a well-developed sense of self-preservation. He’s definitely an intellectual lightweight and he has an amazing ability to convert potentially awkward situations into full-scale disasters. The plans he comes up with to extricate himself from catastrophe are not always entirely stupid but they tend to be over-complicated, to rely too much on a finesse that he does not possess and most fatally they are based on the assumption that other people will react in the way he hopes they will. Jeeves by contrast lays his plans with military precision. Bertie might not be the sharpest knife in the drawer but he’s a good-natured fellow and he’s quite impossible to dislike. Wodehouse uses similar plot devices in most of his stories. His genius lay in his ability to use these plot devices to create sublime comic set-pieces. And of course, most of all, it is his sparkling prose style that makes his tales so delightful. Bertie is the narrator of almost all the Jeeves-Wooster stories and much of the humour comes from his obliviousness to his own limitations. Wodehouse’s reputation as the foremost comic writer of the 20th century is richly deserved. The Code of the Woosters is a delight from start to finish. Highly recommended. Head of a Traveller, published in 1949, was the ninth of Nicholas Blake’s Nigel Strangeways mysteries. It’s a good example of the strengths and the weaknesses of his writing. 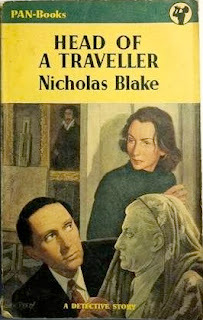 Nicholas Blake was the pseudonym used by noted poet Cecil Day-Lewis (1904-1972) for his detective fiction. Day-Lewis had been a communist in the 30s but eventually renounced his extreme political views. Political themes do appear in some of his detective stories but (mercifully) they rarely threaten to overwhelm them. Detective fiction was a convenient way for a poet to earn some actual money from his writing but his love for the genre seems to have been genuine and mostly he adheres to the conventions of the golden age fair-play puzzle-plot mystery. And it has to be said that he had considerable skill as a mystery writer. Nigel Strangeways is in the tradition of amateur gentlemen detectives although he generally works in fairly close co-operation with the police. When a headless corpse is found in the Thames not far from Plash Meadow, the elegant Queen Anne country home of eminent poet Robert Seaton, it’s not surprising that Nigel takes an interest in the case. The house itself becomes a character in the story, partly because of the extraordinary atmosphere that seems to envelop the house but also because it soon becomes clear that the house itself may provide the most promising motive for the crime. Seaton is a poet who no longer writes poetry and his marriage is far from ideal. The unexplained presence on the estate of an ambitious but talentless painter and his daughter adds to the tensions. Added to this is the fact that Robert Seaton’s son Lionel, who had been a paratrooper in the war, is having some difficulties adjusting to civilian life. Most disturbing of all is Finny Black, the Seatons’ mute dwarf servant. It is obvious that rather deep passions lurk beneath the surface of life at Plash Meadow. The situation threatens to become explosive when the identity of the headless corpse is revealed. Nigel and his old friend Superintendent Blount are faced with a case in which everyone is hiding something, and while there are plenty of clues they are frustratingly ambiguous and contradictory. It has to be said that the author ties the various plot strands together with impressive dexterity. The book is written in the third person but entirely from Nigel’s point of view. The tricky element with this approach is that we’re privy to all of the detective’s thought processes so in order to keep the ending a mystery it is necessary for the detective himself to be unsure of the killer’s identity right up until the end but Blake carries this off with effortless skill. So far so good. This is a well-written well-constructed puzzle plot mystery with some colourful and reasonably (by detective fiction standards) complex characters. Blake’s prose is pleasingly polished. There is obviously much to admire in this novel. I did however have a couple of very big issues with this book. While Head of a Traveller qualifies as a true detective story there are signs that the author was succumbing to the dangerous and pernicious temptation to try to combine detective fiction with Literature. Or at least to add a literary subtext. The result is a powerful demonstration of the folly of such endeavours. He tries to combine the mystery plot with ruminations on the importance of poetry and the nature of poetic inspiration and the challenges facing the creative individual in a world that fails to recognise just how important poets are. Unfortunately his observations on these subjects are somewhat trite and adolescent, they slow things down and they become rather irritating. My second issue has to do with the book’s moral stance. It’s true that many of the great fictional detectives of the golden age occasionally struggle with the conflict between satisfying the demands of the law and the demands of justice. There are times when they are inclined to bend the law just a little, or to feel some sympathy for criminals who are to some extent victims of circumstance. For the most part however the fictional detective (like his real-life counterpart) recognises that while the law may be imperfect it is nonetheless vital. It is all that stands between civilisation and barbarism. With the Nicholas Blake books however we are in real danger of finding ourselves in the quicksands of moral nihilism. Even worse is the implication that art should trump morality. We are presented with a number of characters who believe that art is more important than the law, or morality, or even human life. And Nigel Strangeways shares this corrupting belief. This is something that makes me profoundly uneasy. Head of a Traveller does contain a fine well-crafted detective story. It’s unfortunate that it’s combined with a certain amount of the kind of pseudo-intellectual silliness one would expect from a callow undergraduate. Despite its undoubted virtues it’s difficult to recommend this book without some reservations. Some posts from my Cult TV blog dealing with TV adaptations of pop fiction classics. Honey West (1965-66), based on the Honey West private eye novels of G. G. Fickling such as This Girl For Hire. Mickey Spillane’s Mike Hammer (1958-60), a surprisingly gritty series based on Spillane’s classic tough-guy hardboiled crime thrillers like Kiss Me, Deadly. The Saint (1962-69), based on Leslie Charteris’s wonderful stories although the TV series is closest in feel to the later Saint stories such as those in The Saint on the Spanish Main. Raffles (1977), based on E. W. Hornung’s tales of the great gentleman-thief. The Adventures of Dr Fu Manchu (1956), an underrated series inspired by Sax Rohmer’s celebrated thrillers like The Daughter of Fu Manchu. The Mind of Mr J. G. Reeder (1969-71), superb adaptations of the adventures of Edgar Wallace’s great detective as recounted in the short story collection of the same name. Sherlock Holmes (1954), a criminally underrated series starring Ronald Howard and the always delightful Howard Marion Crawford. Perry Mason (1957-66), an entertaining series although just a little bland when compared to the early Perry Mason mysteries such as The Case of the Counterfeit Eye. 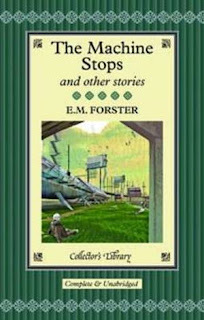 When we think about the pioneers of science fiction E. M. Forster is not exactly the first name that springs to mind. He wrote just one science fiction short story, The Machine Stops, published in 1909. It is however one of the greatest science fiction short stories ever written. It has been credited as being the first story to predict the internet, and social networking. And with some justification. It is also an uncannily accurate prediction of most of the characteristics of early 21st century life. The Machine Stops is the story of Vashti, a woman of the distant future. Humanity now lives underground. All want has been eliminated. There is no hunger, no injustice, there are no shortages, there is no pain or suffering. Everything is provided by The Machine. Civilisation has progressed so far that it can be said that it has more or less reached a state of perfection. The Machine not only provides everything; it knows what people want. Anything not provided by The Machine is clearly unnecessary, and not merely unnecessary but harmful. Vashti has a rich social life. She has thousands of friends. Of course she has never met any of these friends in person, in the flesh. The very idea of meeting people face-to-face terrifies and horrifies her. And there is no need. She can talk to any of her friends at any time she chooses via a view screen. To travel somewhere to meet people would be both absurd and frightening. Why would anyone want to do such a thing? As she tells herself, what was the good of going to Peking when it was just like Shrewsbury? Why return to Shrewsbury when it would all be like Peking? In an early and much more primitive stage of civilisation scientists had made the mistake of thinking that progress meant being about to take people to things. Now it has been realised that it is much more satisfactory to take things to people. Why suffer the inconvenience and hazard of going to look at the sea when the sea can be brought into one’s room via a view screen? If you want to learn about something one can do that much more efficiently by means of a lecture, and to attend a lecture it is not necessary to leave one’s room. One simply presses a button. Lectures are a favourite pastime of humanity in this civilisation. Vashti herself delivers lectures on the music of the Australian Period. (This aspect of the story can without too much of a stretch be seen as an anticipation of blogging and podcasts). The one disturbing element of Vashti’s life is her son Kuno. Kuno is a misfit. For one thing he has shown disturbing signs of physical strength. He can stand up on his own for minutes at a time and can even walk short distances. On his own feet! Such physical prowess is recognised by The Machine as being not merely unnecessary but dangerous. The possession of such useless abilities might unsettle people. Kuno has also displayed a disturbing interest in going outside. Not just outside his room, but right outside, onto the surface of the Earth. This is not technically illegal but it is frowned upon as being unhealthy and Unmechanical. And to do so without a permit, as Kuno has done, is most certainly illegal. Vashti has always been rather fond of Kuno but now she is beginning to realise that it would be better to have as little to do with him as possible. Worst of all, Kuno has voiced the opinion that The Machine might one day stop. Ridiculous of course but even to contemplate such a thing is frightening and upsetting. Vashti is beginning to find life quite upsetting. She has even considered euthanasia. Naturally in a world in which pain and suffering have been outlawed euthanasia is an option, although equally naturally it is not an option people can choose for themselves. It can only be chosen for them by The Machine, which is of course only right and sensible. And things are about to get a good deal worse for poor Vashti. Forster did not of course predict the actual technology of the internet. He simply extrapolated from the technology that existed in 1909. Telephones, the telegraph, gramophone records, motion pictures all existed. Radio had recently been demonstrated to be practicable. The mass media existed in the form of mass-circulation newspapers. Forster drew the obvious (but for 1909 very bold) conclusion that the future would see instantaneous global communication. The exact technical means by which this would be achieved was of no interest to him. What is truly extraordinary is how right on the money he was in predicting the social consequences of these developments. His future civilisation is a world of atomised isolated individuals entirely cut off from reality, and terrified of reality. They have the illusion of having thousands of friends but it is only an illusion. They have sophisticated means of communication but nothing to communicate. Any hint of actual emotion reduces them to panic. It is eerily similar to our world in which everything must come with trigger warnings, and in which absolute conformity is self-enforcing. Forster also accurately predicted the inevitable destruction of family life and the rise of the Nanny State. The Machine is the Nanny State writ large. Forster wrote his story partly as a reply to the socialist utopianism of the science fiction of H. G. Wells. Again Forster proved to be eerily prescient. The Machine Stops is an interesting anticipation of the soft totalitarianism of Aldous Huxley’s Brave New World. The word totalitarianism did not even exist in 1909 but Forster could see that utopianism leads inevitably to rigid conformism and the abolition of freedom and human dignity. Forster seems to have belonged to the tradition of English intellectuals who viewed industrialism with suspicion, a major theme of this story being the dangers of becoming cut off from the natural world and dependent on technology. In this respect it again anticipates the anti-consumerism and the scepticism towards capitalism of Brave New World. There’s even a hint of the use of drugs and mindless hedonism for social control that figures so prominently in Huxley’s novel. Yet another prediction made in this story is the rise of substitute secular regions, in this case the worship (literally) of The Machine. The Machine Stops is an extraordinary vision of a future that has turned out to be all too depressingly accurate. If there’s a weakness in this story it’s the fact that Forster still saw reason for hope. One of the masterworks of dystopian science fiction. Very highly recommended. 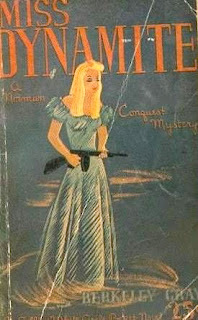 Miss Dynamite was one of the early Norman Conquest thrillers by Berkeley Gray, appearing in 1939. The last of the more than fifty Norman Conquest novels was published in 1969. Berkeley Gray was actually British author Edwy Searles Brooks (1889-1965), who had been an unbelievably prolific contributor to Amalgamated Press magazines such as Thriller. By the late 1930s, inspired by the success that thriller writers like Leslie Charteris (who had also written stories for Thriller) were having in the hardcover market, he decided to tackle that market as well. Which he did with conspicuous success. Norman Conquest might seem at first glance to be a rather obvious clone of Charteris’s hero Simon Templar, The Saint. In fact Brooks had been writing action adventure stories for decades and had already created several heroes of a similar type. He had also written Sexton Blake stories. The truth is that all the great British thriller writers who came to prominence in the interwar years borrowed from their predecessors. Sapper’s Bulldog Drummond thrillers owe something to John Buchan’s Richard Hannay books, as do Dornford Yates’s Richard Chandos thrillers. Simon Templar is in some respects an amalgam of Bulldog Drummond and Bruce Graeme’s Blackshirt. In the late 30s John Creasey’s The Baron would draw on The Saint and his forebears for inspiration. Norman Conquest does have some very Saint-like characteristics but there are some subtle differences. The Saint is a risk-taker but his risks are carefully calculated. The Saint does not undertake an adventure without careful and elaborate planning. He is always in control. Norman Conquest on the other hand pushes risk-taking to much more reckless extremes and he does not believe in planning things out. He improvises, sometimes successfully and sometimes disastrously. Conquest is a much more out-of-control hero than Simon Templar. He’s clever, brave, determined and resourceful but at times he’s lucky to get away with his desperate gambles and excessively bold bluffs. Norman Conquest, like Simon Templar, is a crook who happens to be (mostly) on the side of the angels. He has no moral qualms about relieving other crooks of their ill-gotten gains. Simon Templar gives most of the proceeds of his dubiously legal adventures to charity while Conquest tends more to the belief that charity begins at home. He is however unfailingly generous and more than willing to ensure that innocent victims of crime are amply compensated. Conquest sees himself as a medieval knight-errant born several centuries too late. In Miss Dynamite he stumbles upon a vast criminal conspiracy. It starts in a very trivial manner. His car has broken down and he has befriended a tramp. He then has a rather unpleasant encounter with an officious police sergeant. Norman Conquest is not a man who is overly fond of authority figures who throw their weight about but the incident seems too trivial to worry about. A few hours later the police sergeant is found murdered and the tramp is arrested. Now Norman’s instinctive sympathy for the underdog kicks in. He is sure the tramp was a perfectly harmless and pleasant fellow, not at all the sort of fellow who goes about smashing in the skulls of police officers. As far as Norman is concerned the whole thing just doesn’t pass the smell test. There is something more going on here and he has a hunch the answer, or part of the answer, may be found at the Hall, the residence of Sir Hastings Trevor and his daughter Primrose. Conquest is generally speaking an astute and naturally suspicious sort of chap but he does have one weakness. Given that he sees himself as a medieval knight-errant that means that he has a duty to rescue damsels in distress. He convinces himself that Primrose Trevor is such a damsel in distress. This proves to be a rather serious error and it will lead to other even more serious mistakes. One thing the Norman Conquest stories certainly have going for them is a wonderful sense of exuberant energy, combined with the author’s ability to take a series of thriller clichés and blend them into an extraordinarily fast-moving and exciting adventure tale. There are secret passageways, hidden doors, an armoured headquarters vehicle, fast cars, various ingenious mechanical contrivances, there are plenty of narrow escapes and there’s the exactly the kind of vast criminal conspiracy that thriller readers adore. Conquest faces death from the air, poison gas, death underwater and just about every imaginable danger that an adventure hero could possibly encounter. As an extra added bonus Miss Dynamite features one of the great fictional evil spider women, as deadly as she is beautiful. There’s also an intelligent, courageous and faithful heroine. Norman Conquest is a fine devil-may-care hero, insanely brave, cheerfully reckless, who faces danger with the obligatory store of wise-cracks and impetuous defiance. There are also some amusing thriller fiction in-jokes. The unfortunate murdered police sergeant was an Edgar Wallace fan who was apparently trying to emulate the exploits of Wallace’s heroes. The Norman Conquest series hit the ground running with the superb Mr Mortimer Gets the Jitters in 1937. The early Norman Conquest novels are splendid examples of 1930s British thriller fiction, worthy in every way to stand beside the best work in the genre. Miss Dynamite is non-stop high-octane entertainment. Very highly recommended. J. Jefferson Farjeon (1883-1955) was an English writer of mysteries and thrillers who claimed descent from Thomas Jefferson. Farjeon wrote more than eighty novels and was much admired by Dorothy L. Sayers. 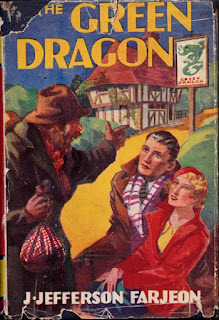 At the Green Dragon was a fairly early work, appearing in 1926. At the Green Dragon is more thriller than detective story. There is no actual detective, and even though the hero and heroine do stumble upon the truth they can hardly be said to do any serious detecting. Jim and Joyce Cresswell are a young honeymooning couple (who have in fact eloped as we learn later) make their way to the isolated Green Dragon Inn after a minor car accident. Jim suffers an injury to his leg, not serious but enough to incapacitate him for a few days (and to increase the required level of suspense and terror). They encounter a jovial but inebriated tramp who warns them that the Green Dragon Inn is a place to avoid. 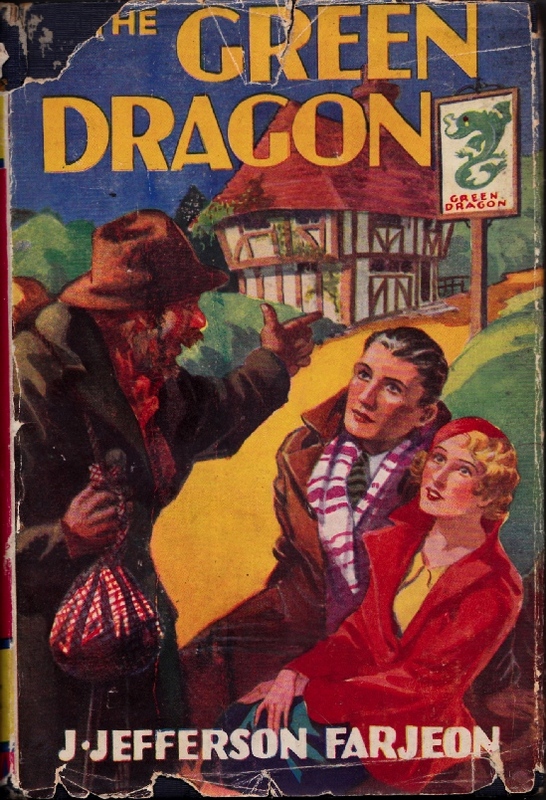 The tramp, Alfred, is particularly upset by the dragon on the inn’s sign - he insists that the dragon’s eyes change colour. This will turn out to be an important plot point, and a definite clue. The inn is deserted and there are signs that the innkeeper must have decamped very hurriedly. They had earlier encountered a wandering artist who seemed rather interested in the inn. In fact quite a few people are interested in this small and not very distinguished hostelry. Jim and Joyce realise that there is something rather serious when they find a very large and very valuable ruby in the possession of a dog. Quite a few people are evidently keen to get their hands on the ruby although the young couple have their doubts as to whether of these people have any rightful claim to the jewel. Those who are seeking the ruby are however very determined - sufficiently determined to be carrying revolvers and to be willing to use them. Of course, as you would expect in a book of this type, there is no telephone at the inn and the nearest police station is some miles away and contacting the police would mean running the gauntlet of some rather unfriendly people with guns. Farjeon throws everything but the kitchen sink into this tale. There’s the inexplicably deserted inn. A fabulous stolen jewel. An enigmatic tramp. A black cat. An inscrutable Chinaman. A hardbitten Australian adventurer. A sinister blind man. A dog that may provide a vital clue. A mysterious ship in a deserted cove. A beautiful, glamorous but evil woman. A heroine in mortal danger. Hypnotism. Oriental poisons. A dragon sign with eyes that periodically change colour. In fact he throws in so many clichés that you can’t help suspecting that it’s all done somewhat tongue-in-cheek. It certainly seems to be intended to be taken as a lighthearted romp rather than anything more serious. What’s most surprising is that the author manages to tie all these outrageous elements into a coherent plot. When the plot is finally unravelled it turns out to be something of a cliché as well but it’s executed with enough verve and enough confidence that really the clichés just add to the fun. There’s plenty of breathless excitement and a surprising amount of action (and even a certain amount of gunplay). The young honeymooners are likeable enough although some readers might grow a little tired of their incessant billing and cooing. Alfred the tramp should be irritating but oddly enough he isn’t. For readers prepared to accept it as the romantic good-natured lighthearted far-fetched adventure yarn that it is At the Green Dragon should be a rather enjoyable read. I started out being a bit put off by the silliness of the plot but as the story progressed and the silliness level kept increasing it gradually won me over. It certainly has its own charm. Recommended. The Golden Scarab dates from 1926 and was the second of Hopkins Moorhouse’s Addison Kent mysteries. Both novels are included in Coachwhip Publications’ The Addison Kent Mysteries. In fact they’re perhaps closer to the thriller than to the mystery genre and The Golden Scarab really is pretty much a pure thriller. Hopkins Moorhouse was the pseudonym of Canadian author Herbert Joseph Moorhouse (1882-1960). Addison Kent is an American popular mystery writer who moonlights as an amateur detective. With his English friend Richard Malabar he investigates the death of a famed French Egyptologist. The Frenchman’s death was put down as being due to natural causes but Kent strongly suspects foul play. A golden scarab from an Egyptian royal tomb disappeared at the time of the Egyptologist’s death, along with a fabulously valuable ruby. The ruby was no Egyptian treasure however, being of much later date. Ordinarily the theft of such a valuable jewel would have led Kent to suspect the involvement of the notorious jewel thief Alceste with whom he clashed in the first Addison Kent novel, The Gauntlet of Alceste. But that’s impossible - Alceste is dead. A beautiful girl reporter is of almost as much interest to Kent and Malabar as the murder and the robbery. Whether she is really a reporter is open to doubt but who is she really and what part might she have played in the mysterious events on the night of the murder? The case proves to be far more complicated that even Kent suspected, with bootlegging, hijacking and very modern gangsters playing crucial roles. This leads to kidnapping and a great deal of gunplay including a full-scale gang war. There are also plenty of the features that had become so familiar to mystery readers at that date. Lots of disguises, but not just regular disguises - we’re dealing here with a man who can change his height at will! All this is combined with even more outré features - sacred cats, mummies, secret agents, secret societies, in fact the author throws everything but the kitchen sink into the mix. To say that the tale defies plausibility would be putting it mildly, but then who wants plausibility in a thriller? Addison Kent doesn’t do very much in the way of actual detection. He stumbles upon solutions and most of the time seems to have very little idea what is really going on. Mind you, I don’t think any sane detective could have unraveled such a byzantine plot. The whole thing is very pulpy but it’s not without its appeal. As the story progresses the author comes more and more to rely on exclamation points! Lots of exclamation points! Thirteen in a single paragraph! Nothing says excitement like an exclamation point! The more the better! It’s all outrageously improbable, but to me that’s a feature rather than a bug. 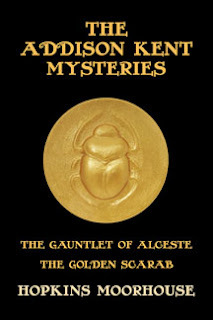 I wouldn’t rate The Golden Scarab all that highly but I am a sucker for mysteries and thrillers that make use of Egyptology (such as S. S. Van Dine’s superb The Scarab Murder Case) so I’m inclined to cut this one some slack. It’s sillier than The Gauntlet of Alceste but it’s more fun. Worth a look but don’t set your expectations too high and don’t expect the plot to make any sense at all.